Jianzhen or Ganjin (鑒真 or 鑑真; 688–763) was a Chinese monk who helped to propagate Buddhism in Japan. In the eleven years from 743 to 754, Jianzhen attempted to visit Japan some six times. Jianzhen was born in Jiangyin county in Guangling (present day Yangzhou, Jiangsu) with the surname of Chunyu (淳于). At the age of fourteen he entered the Buddhist church as a disciple of Daming Temple (大明寺). At twenty he travelled to Chang’an for study and returned six years later, eventually becoming abbot of Daming Temple. Besides his learning in the Tripitaka, Jianzhen is also said to have been expert in medicine. He opened the Buddhist church as a place of healing, creating the Beitian Court (悲田院)—a hospital within Daming Temple. In autumn 742, an emissary from Japan invited Jianzhen to lecture in his home country. Despite protests from his disciples, Jianzhen made preparations and in spring 743 was ready for the long voyage across the East China Sea to Japan. The crossing failed and in the following years, Jianzhen made three more attempts but was thwarted by unfavourable conditions or government intervention. In summer 748, Jianzhen made his fifth attempt to reach Japan. Leaving from Yangzhou, he made it to the Zhoushan Archipelago off the coast of modern Zhejiang. But the ship was blown off course and ended up in the Yande (延德) commandery on Hainan Island (海南岛). Jianzhen was then forced to make his way back to Yangzhou by land, lecturing at a number of monasteries on the way. Jianzhen travelled along the Gan River to Jiujiang, and then down the Yangtze River. The entire failed enterprise took him close to three years. By the time Jianzhen returned to Yangzhou, he was blind from an infection. In the autumn of 753, the blind Jianzhen decided to join a Japanese emissary ship returning to its home country. After an eventful sea journey of several months, the group finally landed at Kagoshima (鹿児島), Kyushu (九州), on December 20. They reached Nara (奈良) in the spring of the next year and were welcomed by the Emperor. At Nara, Jianzhen presided over Todaiji (東大寺), now among the oldest Buddhist establishments in Japan. The Chinese monks who travelled with him introduced Chinese religious sculpture to the Japanese. In 755, an ordination platform for 400 people was constructed. In 759 he retired to a piece of land granted to him by the imperial court in the western part of Nara. There he founded a school and also set up a private temple, Toshodaiji (唐招提寺). In the ten years he was in Japan, Jianzhen not only propagated the Buddhist faith among the aristocracy, but also served as an important conductor of Chinese cultural. Jianzhen died on the 6th day of the 5th month of 763. A dry-lacquer statue of him made shortly after his death can still be seen in his temple at Nara. Recognised as one of the greatest of its type, the statue was temporarily brought to Jianzhen’s original temple in Yangzhou in 1980 as part of a friendship exchange between Japan and China. 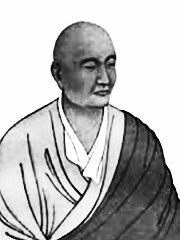 Jianzhen is credited with the introduction of the Ritsu school of Buddhism to Japan, which focused on the vinaya, or Buddhist monastic rules.